HP shares have been pummeled since it split off its enterprise business, but printing revenues, cash flow, and the yield could lead investors to reconsider their pessimism. In terms of investor appeal, HP Inc. (NYSE:HPQ), which inherited Hewlett-Packard's printer and personal systems (PCs, mainly) businesses, drew the short straw in the break-up of the Silicon Valley institution. 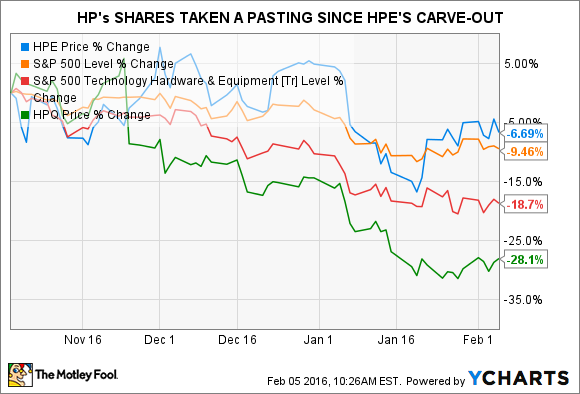 These businesses are in secular decline, while the high-growth prospects of enterprise computing are now housed within the aptly named Hewlett-Packard Enterprise (NYSE:HPE). So perhaps it's not all that surprising that BMO Capital Markets initiated coverage of HP in December with little enthusiasm, assigning it a "market perform" rating and a $13 price target, not far off from the stock's price at that time (the stock now trades at around $10). We believe the secular headwinds facing the company are too difficult to overcome. In PCs, we expect some stability, but secular pressures around units and ASPs [Average Selling Prices] should persist. [...] We are below consensus for the next two years and look for revenue stabilization, particularly in printing, to become more constructive. Printing system revenue: a key catalyst? In its fiscal fourth quarter, which ended on Oct. 31, both personal systems and printing revenue fell 14% year-over-year. But it's clearly the trajectory of the latter business that is more concerning: The printing segment has now recorded 17 -- count 'em, 17 -- consecutive quarters of year-over-year declines (against "only" three straight dips for the personal systems segment). When you consider that, despite this ignominious streak, HP remains the market leader in the printer, copier, and multi-function copier market, you get a sense of just how challenged that market really is. So would a reversal in momentum in the printing segment be enough for HP to warrant a fresh look from investors? That's difficult to answer, of course, but there is certainly reason to think it would be well-received. According to data from Bloomberg, over the past nine quarters, the greatest positive reaction to quarterly results from pre-split Hewlett-Packard was triggered when the company announced a 4.4% "beat" on revenue relative to the consensus estimate for the fourth quarter of fiscal 2013. The causal link between the two looks pretty strong: Forward guidance was unchanged, while adjusted earnings per share beat by just 1%. Remember that this was the same quarter during which printing revenue experienced their smallest decline of the 17-quarter streak -- less than 1%. Revenue growth, however, is not the only possible catalyst. Growth is but one component of intrinsic value, and while HP may be in decline, it remains nicely profitable with a trailing 12-month free cash flow yield that currently exceeds 16%! In other words, for every dollar of share price, HP generated sixteen cents in free cash during the prior twelve months. That cash flow supports a whopping 5% dividend yield. Unlike the payouts of, say, some of the energy majors (and minors), that dividend looks safe. And while cash may no longer be king in a near-zero interest rate environment, the dividend is a tangible return on your investment that is nothing to sneeze at. While this Fool is extremely wary of the idea of investing in a declining business, with its forward price-to-earnings ratio down to just six times, it is reasonable to ask whether the market has overshot on HP, and its price is now discounted due to an excessively pessimistic outlook.